**** CHALET JIRISHANCA - MORE MOUNTAIN. Location Location! Opposite Super Morzine Telecabine. 7 bedrooms all en-suite with outdoor HOT TUB. Modern & Contemporary interior. FREE AIRPORT TRANSFERS in winter. 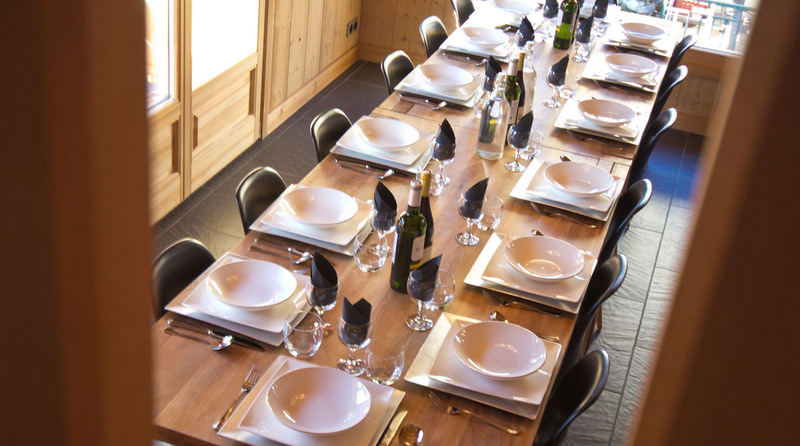 Chalet Jirishanca is a huge catered, luxury chalet for 14 people. Chalet Jirishanca is a huge chalet for 14 people. The ingenious split level design makes it feel spacious, yet still very cosy. The overall feel is cow hides, fluffy throws, brushed wood, contemporary oak furniture, floor to ceiling windows and ambient designer lighting. 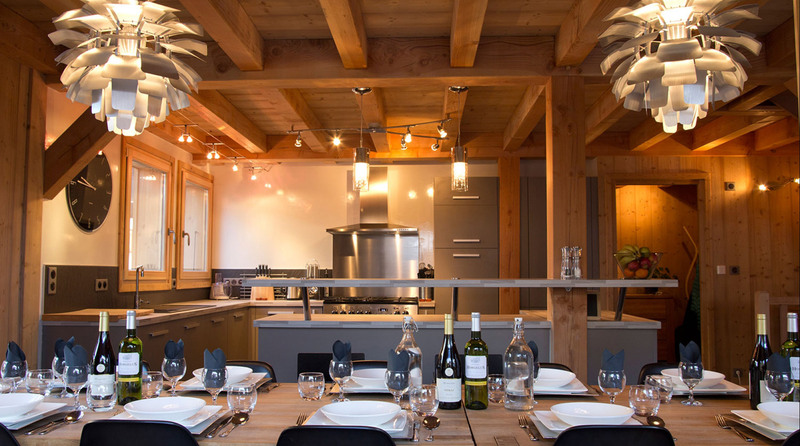 It has a sociable focus around the lounge and dining space… you may be in central Morzine but it certainly doesn’t feel like it! The dining area comfortably seats 14 around a solid oak dining table and features designer “artichoke” lighting and ergonomic Eames DSR dining chairs to provide a comfy seat for the night. Good food, lively conversation and plenty of free flowing wine, plus a new SONOS system and Bose stereo all contribute to the ambience of Jirishanca. 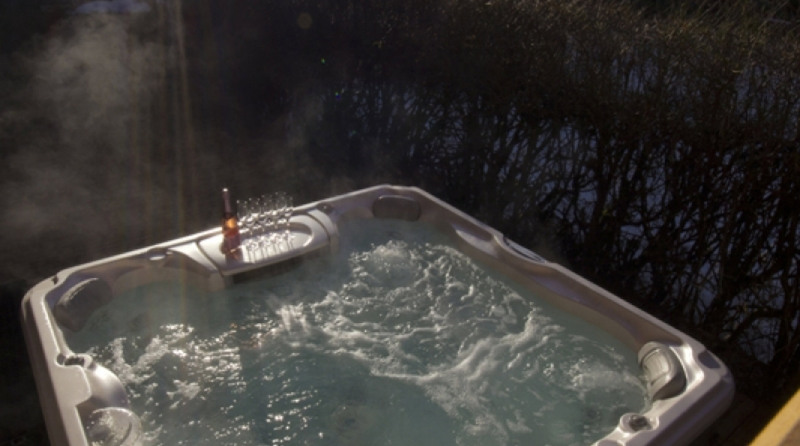 Enjoy the views of the torchlit descent from the Outdoor Hot Tub. You can view the Pleney pistes from the lounge area and soak up the warm glow from the Log Burning Stove. There are plenty of comfy squashy sofas, ideal if you want to kick back with a beer or glass of wine and relax after a hard day on the slopes. Watch some UK TV or DVDs on our Huge Flatscreen TV, check your emails on our iPad with our Free WiFi or head up to the mezzanine for a spot of XBOX 360 Kinect or Wii with your mates. The mezzanine is a separate lounge in itself, great for the kids – big and small! 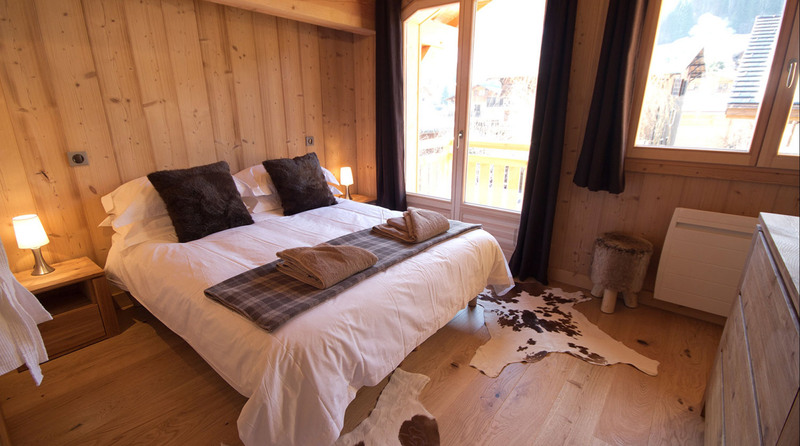 All seven luxury en-suite bedrooms are situated at different levels in the chalet and can be configured as doubles or twins. Chalet Jirishanca can actually sleep 15 people as we also have one room which can sleep three people that can be configured as a triple room or a double with single bed. The bedrooms are cosy and comfortable, some are larger than others but all are well proportioned and sound insulated. We have chosen not to include large chunky wardrobes in an effort to create more space. Instead we feature open hanging spaces in every room and large chests of drawers for storage of all your ski gear. All our bedrooms are equipped with Designer Cushions and Throws, thick Fluffy Towels, luxury MALIN+GOETZ Toiletries, Waffle Bath Robes, crisp white Egyptian Cotton “White Company” style linen, 2 pillows per person and hollow fibre hypo-allergenic quilts. 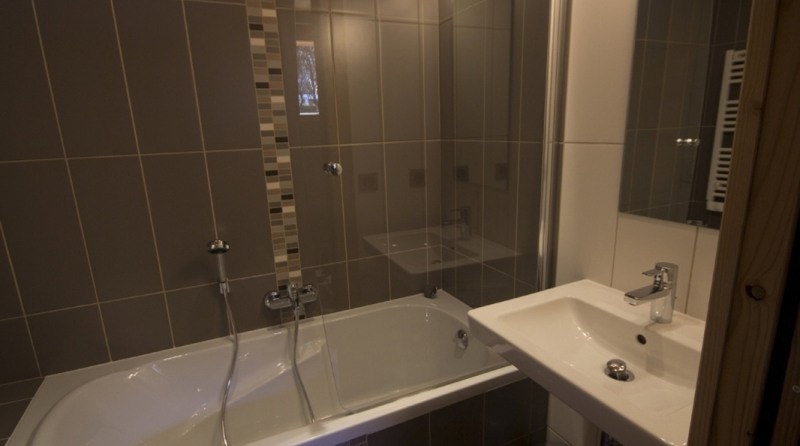 Two of the ensuite bathrooms have baths with power showers, the rest feature wet room style individual walk in power showers, designer bathroom fittings and heated towel rails. Sleeping 14/15 people in 7 ensuite bedrooms, the chalet features a large Outdoor Hot Tub, two lounges with a stunning cylindrical log burning stove, a separate kitchen and large sociable dining area with plenty of space for everyone. There is a mezzanine lounge which features an XBox 360 & Kids TV Area. In addition to this, the open plan lounge, with honesty bar area and log burger, has a vast array of board games & DVDs to choose from. There's also free WiFi and an in-chalet iPad for guest use. The chalet also features UK Satellite TV & free movies via Netflix. There's also both SONOS & Bose sound systems in the chalet. All bathrooms contain luxury MALIN+GOETZ toiletries, the beds are made with Egyptian Cotton Bed Linen, as too are the chalet's robes & towels. 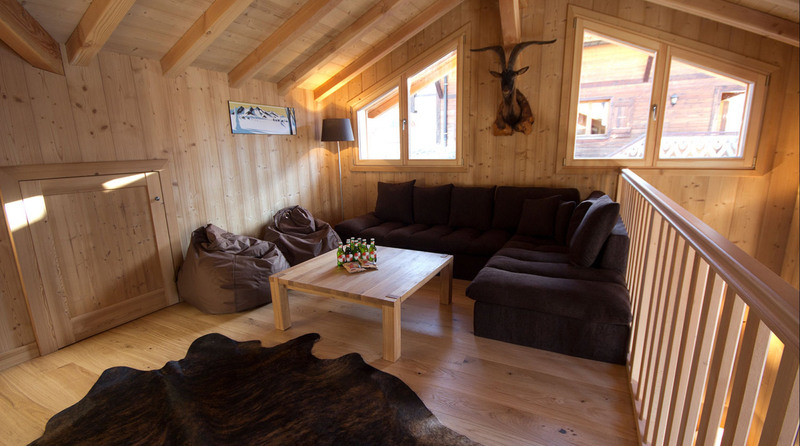 The chalet has a separate boot room with boot driers and digital walkie talkies that can be borrowed by guests. Enjoy a glass of wine with your hosts as they prepare a delicious four course evening meal for you. Our sociable dining space comfortably seats 14 around a rectangular oak table and provides great views of the evening sunsets over the surrounding mountains… Get ready for Wine O’Clock! In a nutshell, our fully catered chalet holiday includes four course “gastro” style evening meals with wine, a breakfast buffet with cooked option, freshly baked cakes after the slopes for six days of the week and access to Nespresso coffee and Yorkshire Tea all day, every day. Click Here to read more about our menu and food in more detail. To make life easy, we include a free airport transfer to and from Geneva. We also offer a “pick up and drop off” service to and from Morzine & Prodain Ski Lifts between 8.30 and 10am in the morning and pick up service after 4.00pm. Also try our “apres ski boot drop” service where we pick you up from the slopes, swap your ski boots for shoes and drop you off at the pub so you can walk back to the chalet at your own leisure. LOCATION LOCATION LOCATION. 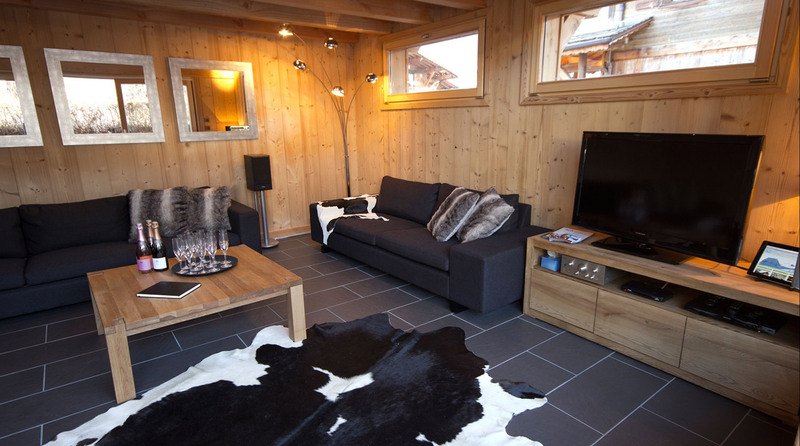 Chalet Jirishanca is situated within a 2 minute walk of the Super Morzine Telecabine. With such quick access to the ski lifts and a huge selection of local bars and restaurants on the doorstep, you won't need to stay anywhere else.